Please register with home address on attendee's photo ID. Avoid fires and burns on the job. Learn how to perform hot work safely and keep your workplace injury-free with Hot Work Safety Certificate Classroom Training. Develop the awareness and understanding you need to avoid accidents, injuries, and tragedies on worksites where hot work occurs. 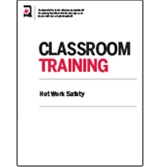 Designed by NFPA® experts, the new Hot Work Safety Certificate Online Training program is vital for anyone responsible for hot work, along with construction managers, safety directors, fire watch team members, and others industry-wide. This accessible online training takes an in-depth look at hot work dangers along with the vital safety procedures that can help promote worker safety and reduce risks. In just a few hours, you'll get the information you need to keep your workplace safe during all types of activities classified as hot work -- such as welding and allied processes, heat treating, grinding, thawing pipes, powder-driven fasteners, hot riveting, torch-applied roofing, and other similar applications producing or using sparks, flame, or heat. Read and understand a hot work permit. These steps help form the basis for creating and managing all hot work activities in a safe and effective manner, using sound fundamentals learned and practiced for many years throughout various industries and trades. A Hot Work Safety Certificate is obtained by taking the Hot Work training and successfully completing an assessment of your learning. The City of Boston requires a Hot Work Safety Certificate for all persons engaged in hot work operations on the work site. This same requirement becomes mandatory state-wide in Massachusetts starting July 1, 2018. All members of the hot work safety team: permit authorizing individuals, hot work operators, and anyone responsible for the fire watch or safety during hot work. Please use the home address that appears on the attendees' state authorized ID (driver's license, etc.) to complete the registration. You must also have a valid email address to register and the email address can only be used on one registration. Directions: www.nfpa.org/directions Ample parking is available. Check in begins 30 minutes before your class. Classes are approximately 3 hours long. Please use the home address that appears on the attendees' state authorized ID (driver’s license, etc.) to complete the registration. This information will be verified by BFD to obtain a Hot Work Permit. You will need a valid photo ID to gain entry to the building and sign in as a visitor.